^ 1.0 1.1 Nigel Warburton. Free Speech: A Very Short Introduction. Oxford University Press. 2009-04-22 [2013-02-08]. ISBN 978-0-19-923235-2. ^ 3.0 3.1 David P. Forsythe. Encyclopedia of Human Rights. Oxford University Press. 2009-08-11: 4– [2013-02-08]. ISBN 978-0-19-533402-9. ^ 民主的原則 Principles of Democracy - 言論自由. www.ait.org.tw. [2017-03-03]. ^ Using Courts to Enforce the Free Speech Provisions of the International Covenant on Civil and Political Rights – Australia & Oceania – Australia & New Zealand from All Business.... [2013-02-07]. （原始内容存档于2009-05-19）. ^ 哲學哲學雞蛋糕: 言論自由和管制言論的自由. 哲學哲學雞蛋糕. 2013-04-17 [2017-03-03]. ^ "Timeline: a history of free speech" The Guardian. February 5, 2006. ^ Raaflaub, Kurt; Ober, Josiah; Wallace, Robert. Origins of democracy in ancient Greece. University of California Press. 2007: 65. ISBN 0-520-24562-8. ^ Smith, David. Timeline: a history of free speech. The Guardian (London). 2006-02-05 [2010-05-02]. ^ Adamson, Barry. Freedom of Religion, the First Amendment, and the Supreme Court: How the Court Flunked History. Pelican Publishing. 2008: 93. ^ 20.0 20.1 de Sola Pool, Ithiel. Technologies of freedom. Harvard University Press. 1983: 14. ISBN 978-0-674-87233-2. ^ Castillo, Anastasia. 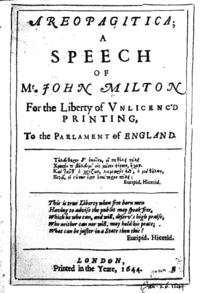 Banned Books: Censorship in Eighteenth-Century England. GRIN Verlag. 2010: 12. ISBN 978-3-640-71688-3. ^ 23.0 23.1 23.2 23.3 23.4 Sanders, Karen. Ethics & Journalism. Sage. 2003: 66. ISBN 978-0-7619-6967-9. ^ 25.0 25.1 de Sola Pool, Ithiel. Technologies of freedom. Harvard University Press. 1983: 15. ISBN 978-0-674-87233-2. ^ Jonathan Israel，Radical Enlightenment，Oxford University Press，2002，p. 265ff. ^ Jonathan Israel，Radical Enlightenment，Oxford University Press，2002，p. 267. ^ Jonathan Israel，Enlightenment Contested，Oxford University Press，2006，p. 155ff，781ff. ^ Jonathan Israel，A Revolution of the Mind，Princeton University Press，2010，p. 76. ^ H. Arnold Barton，Scandinavia in the Revolutionary Era – 1760-1815，University of Minnesota Press，1986，p. 90-91. ^ Sanders, Karen. Ethics & Journalism. Sage. 2003: 67. ISBN 978-0-7619-6967-9. ^ Warburton, Nigel. Free Speech: A Very Short Introduction. Oxford. 2009: 24–29. ISBN 978-0-19-923235-2. ^ 溫朗東. 為什麼公共對話經常變成彼此對罵？（內文不附解答，不喜勿入）. 鳴人堂. [2017-03-03] （中文（台灣）‎）. ^ 【朱家安不要偷懶了】哲學家：言論自由沒有禁止別人批評你. Readmoo閱讀最前線. 2017-03-03 [2017-03-03]. ^ Marlin, Randal. Propaganda and the Ethics of Persuasion. Broadview Press. 2002: 226–227. ISBN 1-55111-376-7. ISBN 978-1551113760. ^ A Decade of Measuring the Quality of Governance (PDF). [2008-04-08]. （原始内容 (PDF)存档于2008-04-08）. ^ When May Speech Be Limited? ^ Freedom of Speech. Stanford Encyclopedia of Philosophy. 2008-04-17 [2013-02-04]. ^ Brett, Sebastian. Limits to tolerance: freedom of expression and the public debate in Chile. Human Rights Watch. 1999: xxv. ISBN 978-1-56432-192-3. ^ 陳郁琦. 焦點評論：仇恨同志不是言論自由. 蘋果日報. [2017-03-03] （中文（台灣）‎）. ^ Kenneth Ira Kersch. Freedom of Speech: Rights and Liberties Under the Law. ABC-CLIO. 2003. ISBN 9781576076002. ^ Wojciech Sadurski. Freedom of Speech and Its Limits. Springer. 2002. ISBN 9781402002816.